Abu Kassim and Mahmud Horsa fled Ethiopia in September to escape the persecution and killings targeted at their ethnic community. Around the same time, Selvin Martinez headed north from his home country of Honduras after he said he was robbed and beaten while working as a cabdriver. When they entered the United States, the three men asked for asylum and were held at an immigration detention center for several months while their legal cases made their way through the courts. When they were released, they had nowhere to go. No jobs, No family here. They now share a room in the top floor of a parish house in Jersey City, which opened last month to provide temporary housing for asylees who have been detained and released with nowhere to go. (right) Abu Kassim prays as (left) Mahmud Horsa puts his shoes on after praying, in a room they share with other asylees at The Lighthouse on Saturday, March 27, 2017. Kassim and Horsa are asylees from Ethiopia. The red brick house called the “Lighthouse” is far different from the Elizabeth Detention Center where Kassim, Horsa, and Martinez slept in dorms, wore prison jumpsuits and were under constant watch. In this house, they have a living room with a fireplace decorated with pictures of the New York City skyline, a kitchen where they can prepare meals, a dining room where they can eat together, and a bedroom where they can sleep and pray. The Lighthouse is a partnership between the Episcopal Church of the Incarnation in Jersey City and First Friends of New Jersey and New York, an organization that sends volunteers to visit immigrant detainees at area facilities and helps to settle them once they are released. In addition to providing a safe haven for up to six guests, the Lighthouse also provides additional resettlement support, such as food, transportation, language tutoring, legal aid and financial support that is made possible through volunteers from area churches and donations. Volunteers have also set up a Go Fund Me site to help with expenses which has raised more than $6,600 so far. The Rev. Jill Singleton, of the Episcopal Church of Incarnation in Jersey City, said the idea of the Lighthouse was in part borne because of a man named Peter, an asylee that Singleton visited at the Hudson Correctional Facility as a volunteer for First Friends. Peter, she said, was born in Nigeria and when she visited him for the first time he told her she had been his first and only visitor during the nine months that he had been detained. On that day, he told her that he had been granted asylum. She said that night she couldn’t sleep wondering where Peter had gone and she thought about opening a house to help others like him. The house is the first of at least two planned in North Jersey to help and house asylum seekers released from detention. The Congregation of Sisters of St. Joseph of Peace who sponsor Holy Name Hospital in Teaneck, are preparing to convert a building they own on Grand Street in Jersey City as a “house of hospitality.” The building, which is vacant, served as a nunnery until recently. “This house that we are opening in Jersey City, I’m hoping is going to be one of several. We are going to open one in the United Kingdom and in the West Coast,’’ said Frank McCann, who is leading the effort to convert the house. He is an associate for the Congregation of Sisters and a volunteer for First Friends. The Lighthouse provides housing to asylees coming out of immigration detention. The Lighthouse opened earlier this month and is a partnership between Church of the Incarnation in Jersey City and First Friends of NY and NJ, a nonprofit that organizes volunteers to visit detainees at area facilities. McCann said the house would probably open early next year and serve between four to eight asylees, most likely women at first. The building, he said, would also house some of the sisters. The congregation’s founder, he said, bought the Jersey City building back in the 1880’s and it was a place where the sisters helped immigrant woman from Ireland. He said in the 1970’s the nuns used the building to house Vietnamese refugees who fled their homeland by boat after the Vietnam War. The need to shelter recently-arrived immigrants is a priority for the sisters, he said, and it only seemed right to use the building again for that purpose. Every year, thousands come to the United States in search of asylum. The United States offers asylum to those who prove persecution based on race, religion, membership of a social group, political opinion or national origin. Unlike refugees, who secure their status outside the United States, asylum seekers request protection while already in the United States or at a port of entry. Once asylum seekers enter the country they can be held in detention. Nearly, 2,500 asylum seekers were held in New Jersey detention centers in 2014, according to a report by Human Rights First, a non-profit human rights organization that provides pro-bono legal representation to asylum seekers. Many asylum seekers held in the Garden State remain in detention often for six to eight months or longer, the report said. Alexandra Goncalves-Pena, supervising attorney for American Friends Service Committee in Newark, which provides attorneys to represent some of the detainees, said that a majority of the immigrant detainees at the Elizabeth Detention Facility who are asylum seekers do not have family members or friends who could offer them a place to stay while their cases await resolution or when they are finalized. Many political asylees can’t be given parole if they don’t have a place to go, which is also among the reasons they are detained longer, she said. Pillay said that at times a few churches have given asylees a place to stay after they are released, and she’s also referred some to the Northern New Jersey Sanctuary Coalition, which sponsors people who have applied for asylum by providing housing, access to medical care and financial support. (center) Abu Kassim, an asylee from Ethiopia, talks with Rev. Deacon Jill Singleton at The Lighthouse on Saturday, March 27, 2017. (right) Anna Fridlis, an ESL instructor, looks on. (Photo: Michael Karas/Northjersey.com) The Lighthouse provides housing to asylees coming out of immigration detention. 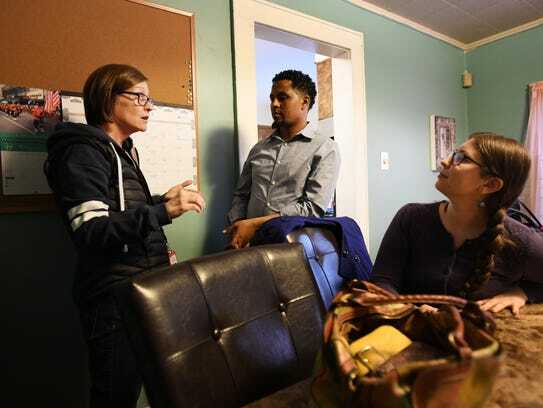 The Lighthouse opened earlier this month and is a partnership between Church of the Incarnation in Jersey City and First Friends of NY and NJ, a nonprofit that organizes volunteers to visit detainees at area facilities. On the top floor of the Parish House, which is connected to the Church of Incarnation, a room with slanted walls has been transformed into a bedroom containing four twin beds. There, Abu Kassim and Mahmud Horsa talk about what led them to leave their families and their homeland and their hope for the future. “I didn’t finish school and I want to continue,” said Kassim, who had recently married and left his bride in Ethiopia. He said he wants to help his parents back home financially as well as bring them to the United States one day. Kassim and Horsa, who met after arriving from Africa on the same plane, fled violence in Ethiopia and were granted asylum in January. They are members of the Oromo people, an ethnic group who have been persecuted, imprisoned and killed by military police in Ethiopia. Kassim said he was detained in a jail for months for participating in a protest Horsa said his father was killed. “The problem is the government. There is still so much struggle over there, so many people suffering,” he said. Both men say they are grateful for the help they have received, the house that they get to stay in while they look for work, and expressed awe that they have been welcomed with open arms by volunteers representing different faiths. They share the house with Martinez, a woman from Burkina Faso, and a man from Syria. Martinez, who is 22, and whose asylum application is still pending, said he was seeking asylum because gang members robbed him of money and his mobile phone one day during his shift as a taxi driver. The thieves, he said, then called everyone on his phone’s contact list, demanding money and threatening his life. He left Central America in September and was caught by border patrol officers after crossing in from Mexico in October, he said. He was recently released from detention after he paid a $20,000 bond and after he was fitted with an ankle bracelet. Martinez, who mainly speaks Spanish, has become the house cook, preparing rice, beans, avocado and other Honduran staples. He said he dreams of finding a job and learning English.